You are here: Home>New contributions>David D'Arcy Greig's Lucky Escape. On the 22nd April, 1927, David D’Arcy Greig DFC, a test pilot attached to 24 squadron, RAF Kenley, had a close shave which nearly cost him his life, whilst carrying out a spin test on a Gloster Gamecock. Intentional right-hand spins were forbidden in the Gamecock, as high engine torque made them practically impossible to recover from, using conventional methods. After twenty seven turns and a height loss of 6000ft, Greig’s aircraft became uncontrollable and he had no option but to take to his parachute. He was flung clear as the wind caught him and fell for several hundred feet before regaining his wits enough to pull the ripcord. The wind caused him to drift for about two miles before landing safely. The Gamecock, on the other hand, was loaded with more than fifty gallons of fuel. Greig saw it erupt in a sheet of flame at Riddlesdown, as he descended on his ‘chute. Miraculously, Greig was uninjured, picked up his parachute and set off to try and find a telephone. The first person he encountered was a little girl called Betty Knight, whose Mother ran the Hare and Hounds pub in Chelsham. She was quite taken aback by the appearance of this strange man who she later described as “wearing women’s clothes, carrying sheets.” He asked her where he could use a telephone and she directed him towards Fairchilds, the home of Colonel Arthur Stewart Daniell. He was back at Kenley within the hour. David D’Arcy Alexander Greig was born in Scotland on the 1st of February 1900. He was given a private education, first at Weston House School, Elgin and then at Elgin Academy. The 1911 Census of England and Wales, shows that in 1911, he was a boarder at Shrewsbury House. David joined the new RAF in 1918 and saw service with No. 83 Squadron in France in the last year of the war. On the 13th of September, the FE 2B biplane he was flying was shot down behind German lines. He avoided capture and walked 13 miles through enemy territory and the German front line to reach his unit. Whilst an Instructor at the Central Flying School in 1924, he carried out aerobatic displays with John Boothman, where they did a mirrored falling leaf, with Boothman being inverted. During one of these displays, Greig’s aircraft fell apart in the air but fortunately he walked away from the wreckage uninjured. He also led the CFS aerobatic team of five Genet Moths in 1927. Selected as a member of the High Speed Flight, he later (1928) raised the World Air Speed Record to 319.57 mph in the Supermarine S5 and won the Schneider trophy in 1929. David D’Arcy Greig retired from the R.A.F. in 1946 with the rank of Air Commodore. Kenley Scramble, Richard C. Smith. 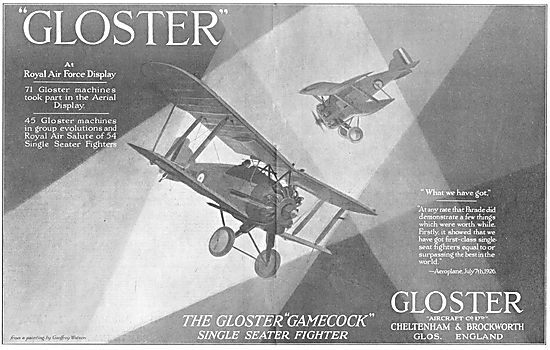 Gloster Gamecock advertisement from ‘Aeroplane’ magazine, 15th December, 1926.